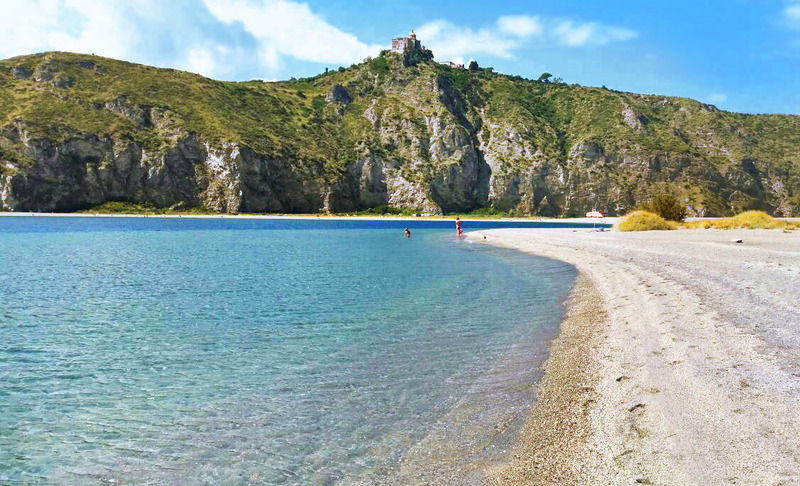 Because it’s so cold and there is too much snow outside, I decided to warm, energize and delight myself, and hopefully also you, by talking about one of the best places we choose for our vacation last summer: Marinello beach. Have you ever heard about this nature's treasure? Imagine to fly by means of your mind to the sea. To the extreme south of Europe. The sky is blue and the air is warm. You reached the Sicilian Northeastern coast. And here we are, in Marinello town. 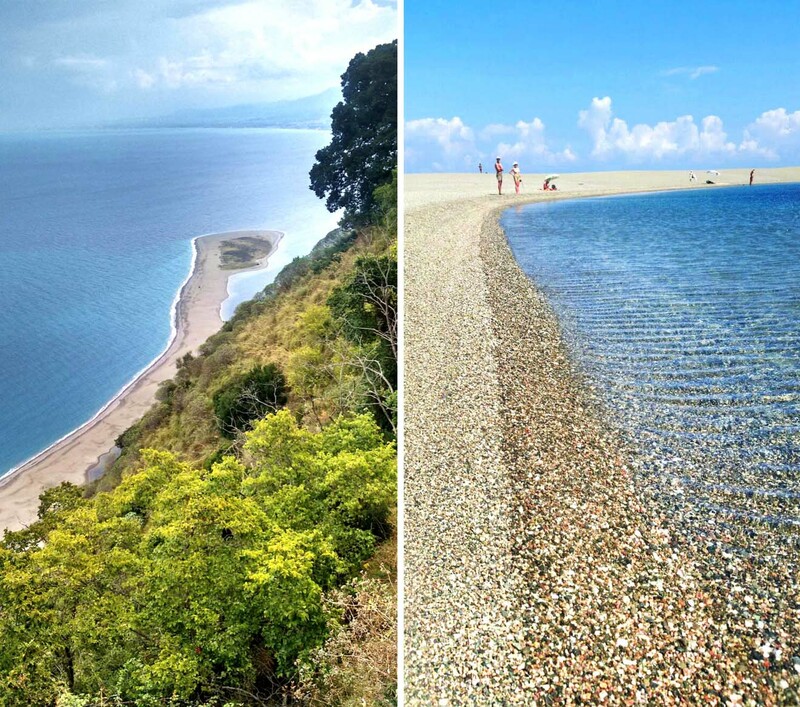 This amazing Marinello beach and the marine lakes nearby are surmounted by the hill where the popular sanctuary of the Tindari's black Madonna was built. From the square where this temple is located you get an impressive view over that clear pebbles bay, characterized by a peculiar shape, which slightly changes due to the erosion over the time. Pictures of several years ago proved that there was a time in which the shape of this seaboard "miraculously" resembled a praying woman profile, exactly depicting the black Madonna herself. 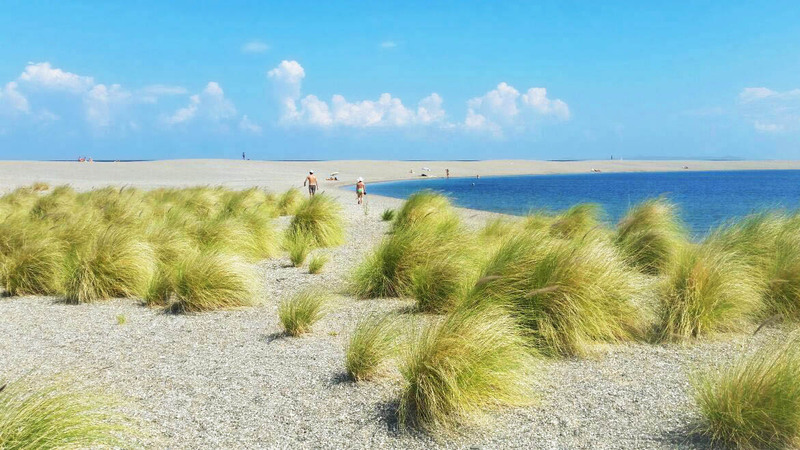 Nowadays, the woman silhouette is not anymore recognizable (note the sandy peninsula in the photo above, on the left), but the special conformation makes this place an interesting natural site, which surely deserves a visit. But let me tell you about the "mythical origin" of this marvelous Marinello beach merging Divine and Nature. Popular legends narrate a story about a woman, a pilgrim, who reached the Tindari's sanctuary to say thanks to the Madonna for having healed her young daughter from a dangerous illness. The little girl was fine again and came to the temple with her mother. "I walked so long just to honor a Madonna whose face is even uglier than mine". And then the miracle happened: the little girl was safe on the ground of a beach, the Marinello beach, formed right then and defined with a profile resembling the black Madonna while praying God. Therefore, the woman regretted the bad words against the Madonna and she finally honored her. 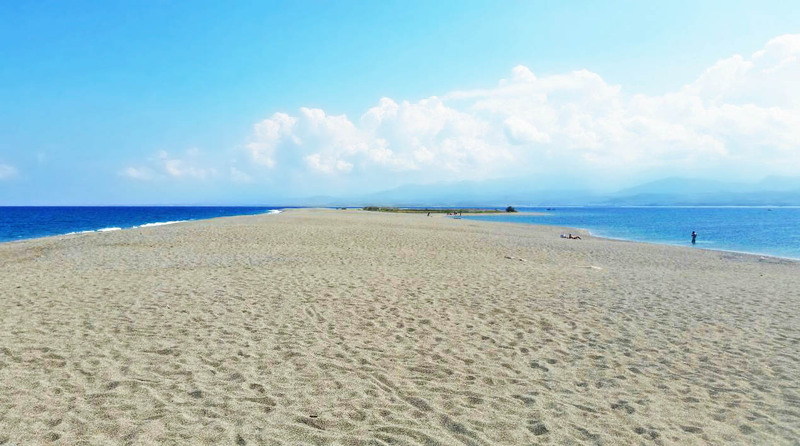 This "sacred beach" is definitely a special place, ideal for low-season vacations, when it is not so crowded and you can enjoy a solitary bath in the blue sea while admiring the sanctuary hill backdrop. Like every year we wanted to spend some last summer days in our motherland Sicily (I think I will never finish learning about wonders which my island holds ♥). And this amazing Marinello beach, we visited in the middle of last September, was one of our favourite stops. 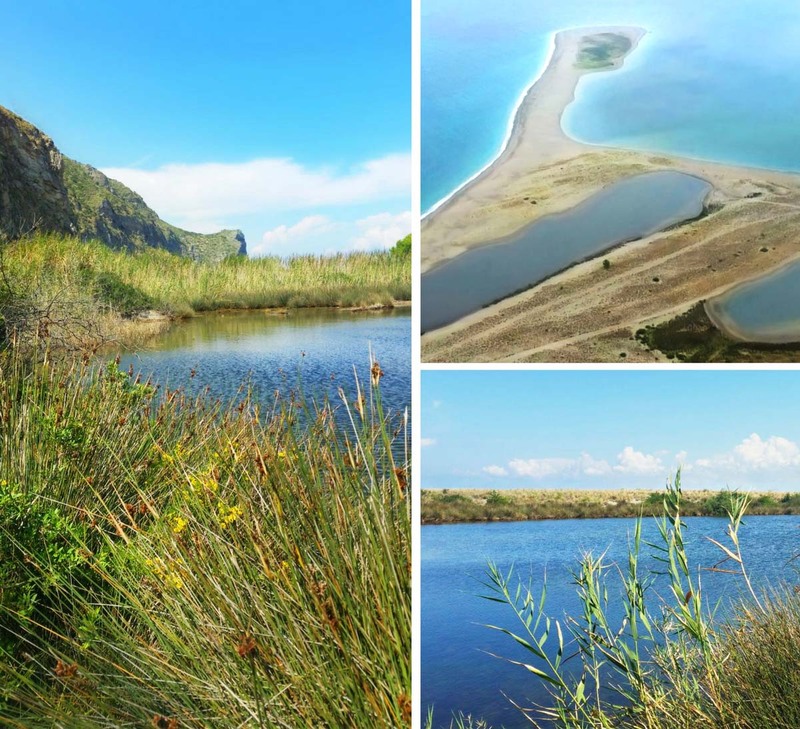 We spent a pleasant sunny morning at the Marinello nature reserve. The beach area is quite big and long (entrance point map here, from the east side of the bay), and it really took a while to reach the part of the littoral situated towards the Tindari's sanctuary cliff. Then we walked through several nice footpaths, beside the small marine lakes, surrounded by the typical low mediterranean flora. And we could enjoy the untouched environment around, smell the vegetation scents and watch the marine birds. And when we finally reached the seashore, we found only few people there: some persons were lying down on the beach, others were slowly swimming in the inviting blue water. So we decided to stop a bit in this lost paradise, without any noise and services . 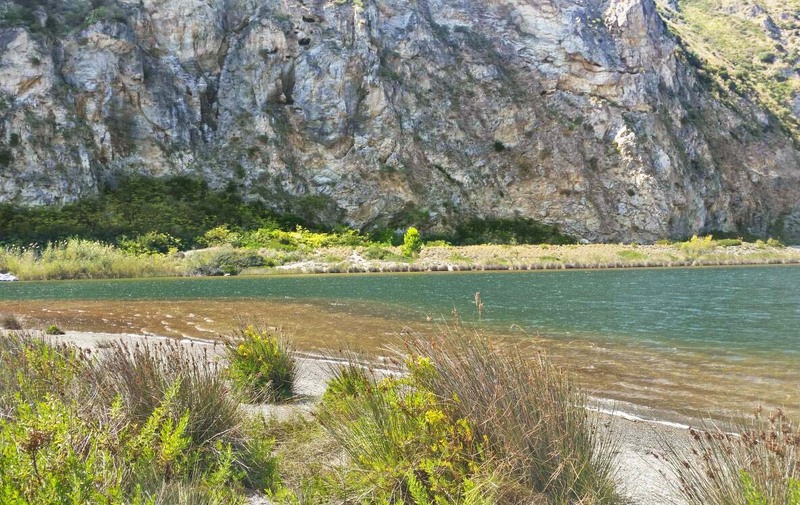 Indeed Marinello lakes and beach belong to the namesake protected area. But after a while, my curiosity pushed me to continue exploring the beach which increases on one of its sides by forming a long unusual peninsula, almost entirely surrounded by the sea. Lots of time ago, this sandy branch, where only few marine plants can grow up, should have been characterized by the praying woman silhouette, according to the legend. We walked till we reached the farthest peninsula edge. What a terrific sensation of being in an infinitive space! The immense sea in front of me... while the beach, the wild marine lakes and the sanctuary mountain so far behind me. I felt an indescribable emotion. That was a memorable day overall: I cannot forget our adventure in such beautiful and mystic place. Oh...Now I can feel this exciting vacation atmosphere, don’t you? And I would like to keep it in the air still for a while, before concluding my post. 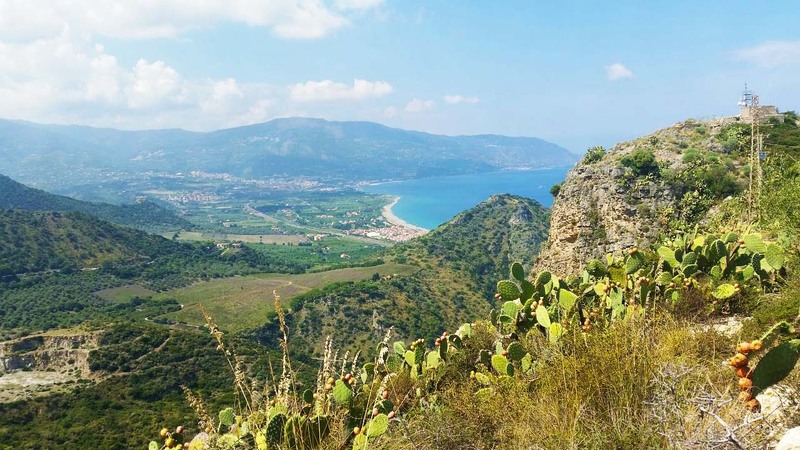 So let me mention a short tour of Tindari we tried during our planned Marinello weekend. Indeed we visited the Tindari’s sanctuary on saturday late morning, and went to explore the namesake beach on sunday. We spent less than half a day in Tindari, but definitely we needed more time. You should know that you cannot reach by car the hilltop where both old and new Tindari churches are located (opening and closing time here). But you can use the available bus services starting from the parking area, as we did. Beyond the fact that this is an important religious site, I can really recommend people to visit these temples because of their suggestive atmosphere and interesting architecture (and ... I think I could tell you more and more details about that site, but this is not the purpose of my post; you can find additional info elsewhere, over the network). I also loved a special window built in the old church (the antique sanctuary), from which I got the best view over the whole Marinello bay . I can remember we arrived in late in Tindari and hence our tour inside the old temple was fast, because the guardians had to close the entrance doors. 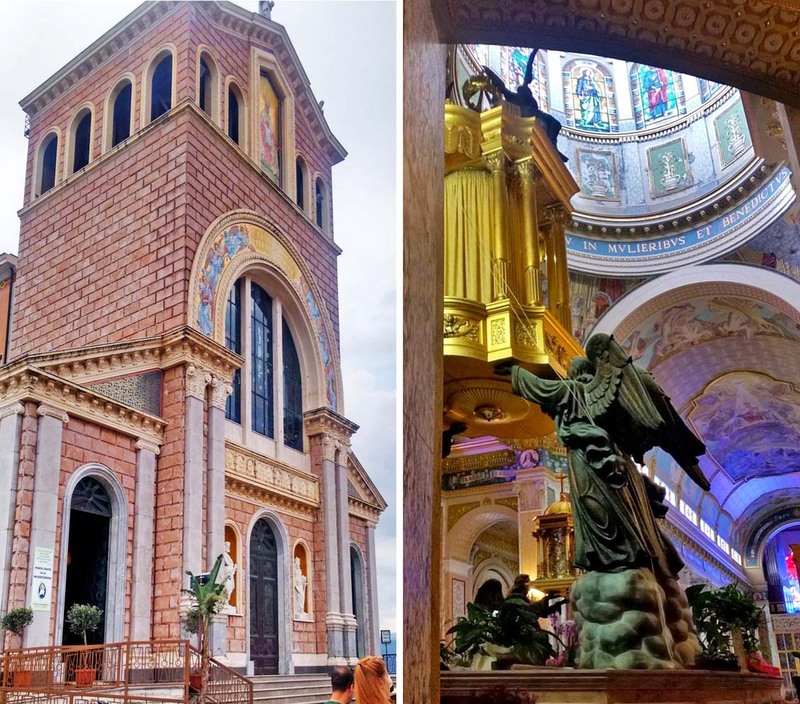 It is also possible to enjoy an amazing panorama from the square in front of the sanctuary. That is a great location for lots of blue sea background selfies! And if you want to experience a bit of folklore and bring back something special to your beloved people, you can walk along the vivid shopping ways, and then stop by the typical souvenir markets. Eg: we bought some great artisan miniatures and exquisite sicilian sweets. Past the short and colored shops alley on the hilltop, we proceeded ahead and found a nice path guiding us through the characteristic local houses, and further through a way where different kiosks were selling their palatable grilled sicilian sausages, served with sandwiches (map here). Uhmm.. so delicious! We tasted them while sitting at a fresh table under the trees and while enjoying the stunning seascape from that high point of view. Definitely an experience to try! From there we could also see the gate to access the ancient Tindari Greek theatre, located on the hill side towards the Marinello beach sea. We regretted not to have the time to give a look at this relevant piece of history. So many past heritages and things to do on this small Tindari hilltop! So… I ended my looong description/ memories/ tour. I was happy to relive and share with you those summer pleasant moments, especially in these veeery cold and silent winter days. And my great hope is that I brought to you, at least for a while, the typical sunny and energetic vacation atmosphere I feel every time I come back to my Sicily! A lovely post Lilah, I quite enjoyed it. We toured Sicily the summer of 2011 (what incredible memories we have!!!) but sadly we didn't have time to see this. But that's why I love blogging - I can still learn about places and maybe will be given the chance to see them myself in the future! Yeah! You did it! You gave me all the colors and the flavors and warmth of Sicily. I was with you on that beach and I also felt a sense of immensity all around me. Il teatro...sai che non sapevo ci fosse? E che dire della storia? L'ho letta con tanto entusiasmo e mi è piaciuto moltissimo immergermi in essa. Grazie Vale per il tuo bel commento! È proprio quello che spero: riuscire a trasmettere le emozioni provate! Sono contenta che il post ti sia piaciuto. Il teatro..nemmeno io lo sapevo, infatti poi non ho avuto il tempo di visitarlo e ne valeva la pena. Dai, la prossima volta... :) Grazie ancora per la visita. what a beautiful story!! piena dei tuoi sentimenti ed emozioni...le immagini della tua sicilia sono stupende!! viene voglia di partire subito :) grazie per averlo condiviso ...aspettiamo il prossimo viaggio! Grazie sempre per il sostegno! So very, very, very beautiful! And such an interesting folktale ... proof that you should think before you speak. Or better yet, if you don't have anything nice to say, don't say anything at all. :) Thanks for sharing a gorgeous spot in Sicily. Dear Tammy, thank you so much for your visit! I'm happy that you liked my little Sicily spot. You told exactly the moral of the Miracle Story: we should avoid prejudices and stay opened to what is different, otherwise "better not to speak" :)). Questo è uno dei luoghi della mia terra che più amo. E' stupendo e pieno di ricordi per me. Anche io lo adoro. In realtà penso che ogni parte della Sicilia può vantare dei posti eccezionali. La nostra isola è magnifica.